AUCD’s Diversity & Inclusion Toolkit is intended to serve as a framework for launching a national effort to enhance diversity, inclusion, and cultural and linguistic competence; cultivate partnerships; respond to increasingly diverse communities across the country; and develop strategies for continuing efforts to better serve diverse populations. The Toolkit is based on existing conceptual frameworks addressing cultural competence in health and healthcare (Betancourt et al, 2003), and children’s behavioral health (Cross et al. at Georgetown University Child Developmental Center, 1989). In developing AUCD’s Diversity & Inclusion Toolkit, these elements and interventions have been addressed through a series of objectives with accompanying supporting strategies and resources. Fourteen objectives are organized in five themes that are informed by the 3-part framework of Betancourt et al., while also responding to the specific context of federally-funded Centers and Programs whose work extends beyond health and health care. The 14 objectives of the Toolkit are organized into these five themes: infrastructure, funding, performance measurement, personnel and trainees, and core functions. Strategies provided for each objective are intentionally broad and varied, in order to provide meaningful tools and information to each individual, organization, or system regardless of where they currently exist along the continuum of cultural competence, as described by Cross et al. at Georgetown University Child Developmental Center (1989). This Diversity & Inclusion Toolkit is informed by existing research and multiple stakeholders. Evidence-based and grassroots input are blended purposefully to reflect academic and community perspectives. 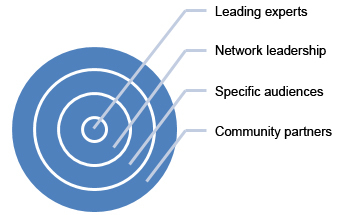 The voices of many network members and partners are woven throughout this product, and reflect the following range of stakeholders: 1) leading experts in diversity, inclusion, and cultural and linguistic competence in the UCEDD and LEND networks; 2) AUCD network leadership including select members of the Board of Directors, Council chairpersons, and Special Interest Group (SIG) leaders; 3) specific audiences including AUCD and AIDD staff, people with disabilities and their family members, UCEDD and LEND Directors, researchers, clinicians, educators, trainees, staff, and advisory group members; and 4) community partners representing immigrant support networks, organizations for disabled people, faith communities, community artists, social justice activists, health equity councils, philanthropists, LGBT rights and advocacy groups, and federally-funded cultural and linguistic competence TA providers. AUCD recognizes that each network member Center and Program brings different resources, partnerships, initiatives, and other considerations to the effort to increase diversity, inclusion, and cultural and linguistic competency within their organizations. Additionally, the geographic location of each Center and Program provides a different cultural community context in which to address the goals of greater diversity within the organization and in the systems within which the organization operates. Other audiences for this Toolkit, federal funders including AIDD and MCHB, and also AUCD itself, also bring their own considerations, contexts, and roles in the overall system in which we work. Thus, each entity using the Toolkit will develop its own individualized plan for implementing strategies outlined in this Toolkit, in a joint effort to create increased diversity, inclusion, and cultural and linguistic competence in disability education, research, and service systems. Cross et al. at Georgetown University Child Developmental Center (1989) explain that “planning must be approached with the developmental nature of the acquisition of cultural competence in mind. Not all agencies will approach the issue in the same way and each will have a different timeline for development. Through the use of this or similar planning approaches, organizations can avoid feeling that the task is unmanageable and each can develop at its own pace in ways that make sense in the context of the organization.” Each organization within AUCD’s network will have a different plan and approach while all work toward the same goal of increasing diversity, inclusion, and cultural and linguistic competence; and therefore the strength and effectiveness of each organization and the overall network. It is our deep hope that this Toolkit provides a framework for network-wide discussion, action,further research, and future initiatives at individual, organizational, and systems levels. Betancourt, J. R., Green, A. R., Carrillo, J. E., & Ananeh-Firempong 2nd, O. (2003). Defining cultural competence: a practical framework for addressing racial/ethnic disparities in health and health care. Public health reports, 118(4), 293. Georgetown University Child Development Center, CASSP Technical Assistance Center. (1989). Towards a Culturally Competent System of Care: A Monograph on Effective Services for Minority Children Who Are Severely Emotionally Disturbed. Washington, DC: Cross, T. L., et al.